Picture yourself cruising the crystal clear turquoise waters of the Mediterranean surrounded by world-famous cultural heritage sites like Dubrvonik and dense archipelagos like the Kornati Islands and their natural beauty. Croatia has it all – majestic walled cities with medieval cobbled streets, ancient ruins, vineyards, forests, deserted coves, and over a thousand islands to discover. Whether for a week-long tour with friends and family or a romantic getaway, we have the boat to accommodate your needs. Snorkeling, diving, fishing, culture, shopping, romance, fun... something for everyone is awaiting. Discover Croatia's variety: medieval cities, ancient ruins, beaches... Šibenik is one of the Adriatic's most picturesque cities Luxury Yachts in Vis Town Yachts moored on Hvar Island Enjoy the crystal clear turquoise waters of the Mediterranean Sea. Šibenik Marina Dubrovnik is a Lovely Port Town to enjoy Spectacular sunset in Dubrovnik Croatia is an effortless blend of old and new, historic and hip. Visit the Dubrovnik's castle Snorkeling, culture, shopping, romance... something for everyone! CROATIA BAREBOAT CHARTERS - The ultimate in privacy & freedom, bareboat rentals are for groups having their own qualified skipper. Hiring a captain and or hostess/cook always remains an option. For a list of our available Bareboat yachts, please Click Here. Today’s Croatia is an effortless blend of old and new, historic and hip. Croatian hospitality is warm and genuine and renowned in the sailing community as well as its beautiful coast which is one of the sunniest in Europe. Whether you are looking for medieval cities, ancient ruins, natural beauty or little islands to discover, you will find it in Croatia. 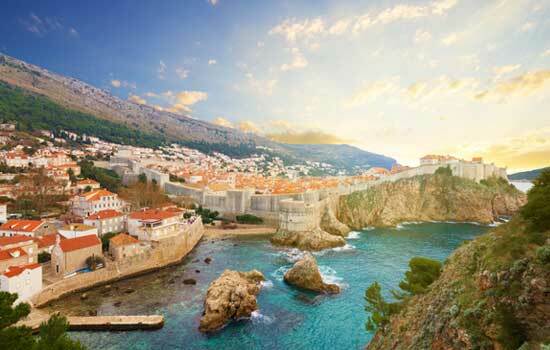 Dubrovnik Base: Enjoy this amazing medieval walled city before sailing through the islands. The Base is just 30 minutes from the airport and Dubrovnik city, dating back to the 6th Century, holds an interesting mix of architecture as well as plenty of chic bistros, bars and restaurants. Explore historic towns and sleepy fishing villages along a stunning coastline with spellbinding highlights like ‘the golden island’ of Sipan and the idyllic national park of Mljet, the third most densely wooded island of Croatia. 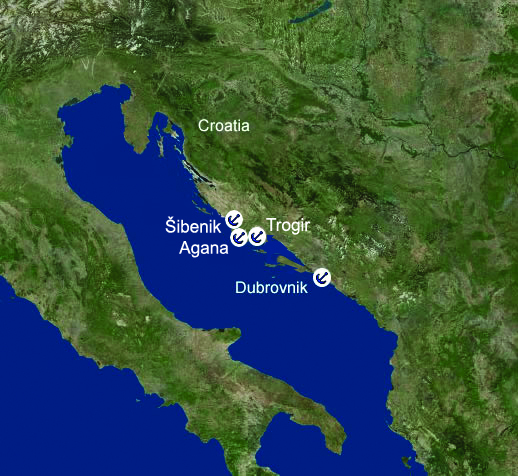 Agana Base: The Dalmatian Islands in Croatia are among the most famous in the Mediterranean region. Wild, rugged, and mostly uninhabited, many are protected as national parkland and offer a varied and diverse cruising ground for an Agana sailing vacation. The sailing is splendid, encompassing long and short passages to charming anchorages amid rocky islets, ancient villages steeped in history, and translucent waters. An Agana yacht charter typically focuses on the more than 30 islands off the central Dalmatian Coast near the city of Split, including lovely Solta, Hvar, Vis, and Brac. Pristine beaches, lively nightlife, fine cuisine, secluded coves, fascinating historic sites, and an unspoiled natural setting make an Agana yacht charter an unforgettable sailing adventure. Zotan Marina Šibenik: Zotan Marina is located in Šibenik, the most protected natural harbor and a historic city in Croatia, located in central Dalmatia where the river Krka flows into de Adriatic Sea. Šibenik is a political, educational, transport, industrial and tourist center and also the 3rd largest city in the historic region of Dalmatia. It is the oldest native Croatian town on the shores of the sea. The Dalmatian Islands in Croatia are among the most famous in the Mediterranean region. Wild, rugged, and mostly uninhabited, many are protected as national parkland and offer a varied and diverse cruising ground for an Agana sailing vacation. A Dubrovnik sailing itinerary takes you to the stunningly beautiful turquoise waters of Croatia's Dalmatian Coast, its shoreline indented with coves and bays, marked with rugged peninsulas, and bejeweled with large and small islands just offshore. The pleasant climate and steady winds make for a superb sailing vacation as you discover the dazzling Dubrovnik Riviera. A Dubrovnik sailing itinerary could take you to one of many stunning islands that are within easy reach of the mainland. You'll be spoilt for choice when planning your Trogir sailing itinerary. With its convenient access to some fantastic cruising grounds, there's so much to see and do. Whether you choose to head north or south, you'll discover picturesque islands, beautiful bays, and bustling towns steeped in cultural heritage, whilst enjoying perfect cruising conditions.